As a gluten and dairy-free blogger, I think of gluten-free expos as fun holidays where I can mingle with brands and fellow gluten-free foodies alike. While industry shows have a lot more going on, local expos are consumer-focused and showcase gluten-free resources in the area. 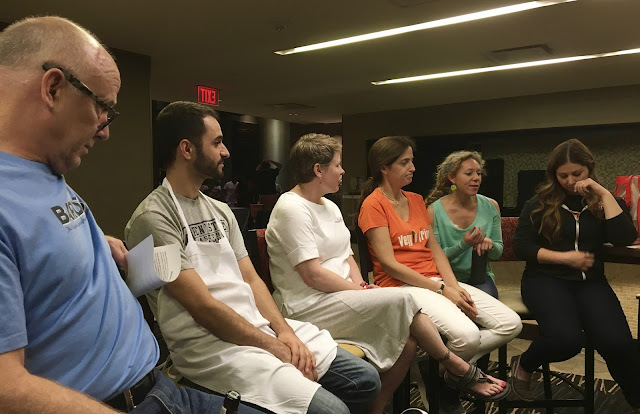 Last week, I attended the Washington, D.C. Gluten-Free Expo, hosted at the DoubleTree in Bethesda, Maryland. 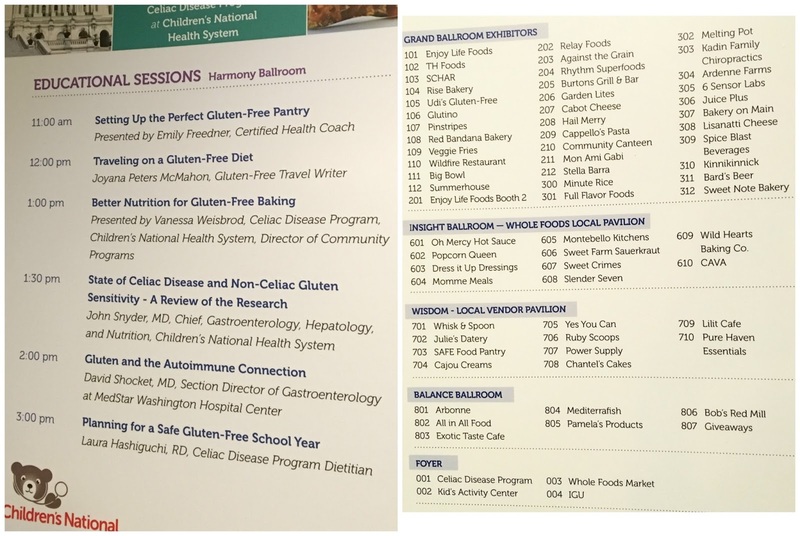 The event, now in its sixth year, is sponsored by the celiac program at Children's National Health System, an integrative center for caring with kids with celiac (more on that later). As a blogger, I was able to engage in a blogger and brand dialogue before doors officially opened, then hit the show floor to check out brands both familiar and new to me. Though this post may be a bit info dense, there's so much to share- and even a giveaway of goodies I picked up at the expo! As with most gluten-free expos, the day was structured around educational sessions and an open expo floor. I did not attend any of the sessions because I was on a tight schedule, needing to catch an early train back to Baltimore that day. Before doors opened to the public, the organizers gathered bloggers over breakfast to have two part discussion, the first about Children's National's celiac center, and the second a nice dialogue between exhibiting brands and bloggers. I definitely left with a lot more knowledge about Children's National's holistic approach, and a healthy dose of respect for the people behind the restaurants, bakeries, and products I rely on to be gluten-free. It takes their hard work and commitment to those who medically rely on the gluten-free diet stay safe, get healthy, and enjoy eating once again. Represented in this photo: Bard's Beer, Rise Bakery, Ardenne Farms, Veggie Fries, Sweet Crimes Bakery, and Enjoy Life Foods. 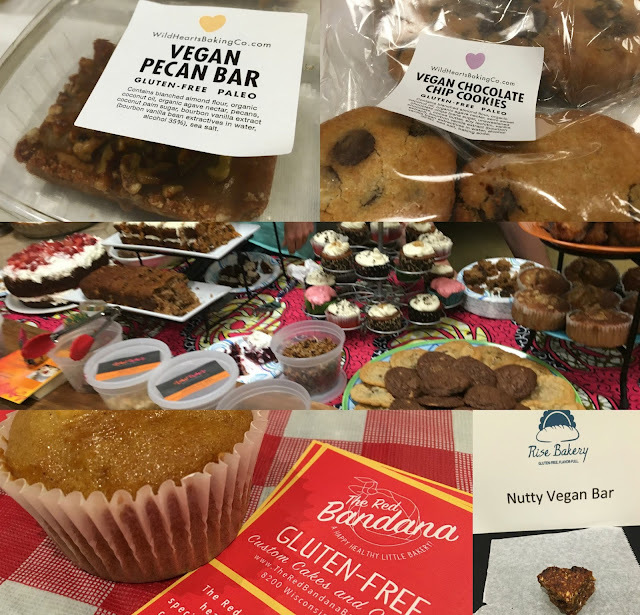 Mollie Mahon's Wild Hearts Baking Co. produces baked goods designed to be nutrient dense and naturally sweetened. Her treats are gluten-free and paleo, locally made in Union Kitchen. She had pecan bars and chocolate chip cookies on hand, and I immediately bought a full bag of each after one sample. The cookies were soft baked and in classic chocolate chip cookie fashion while the pecan bars were totally decadent and rich without the guilt. I sorely regretting not buying more that day, and will definitely seek out Wild Hearts on my next D.C. food scouting adventure. Sweet Crimes is a new bakery with distribution at local D.C. farmers markets. While most of the items were not dairy-free, I was able to try zucchini bread that was definitely delicious. Sweet Crimes also uses Union Kitchen space to produce their baked treats. I loved how the owner puts her passion in to her treats and cares about serving the gluten-free community. The Red Bandana is a Bethesda bakery producing all gluten-free treats with many vegan and dairy-free options. I tried a peach muffin, and was impressed with the spot-on texture and moistness. Not too sweet, not too sticky, the muffin impressed me- and I don't even like peaches. What really sold me was owner Jaimie's enthusiasm and clear commitment to making good and good-for-you baked goods. I will definitely be checking out their upcoming storefront in the fall, and in the meantime will try to seek them out at the Bethesda Central Farmers market a weekend this summer. Last but not least is Rise Bakery, a local D.C. bakery in Adams Morgan. Though dairy can be a hazard here, they brought their nutty vegan bars as a showcase of dairy-free options, and I definitely had to check it out. The healthiest product Rise makes, the nutty vegan bar is packed with nuts, fruit, and seeds held together with date paste to make one chewy, crunchy bar. I found it immensely satisfying, and was sweet but not overly so. I definitely did not feel guilty giving this bar a try, and definitely will look in to more dairy-free options at Rise sometime soon. 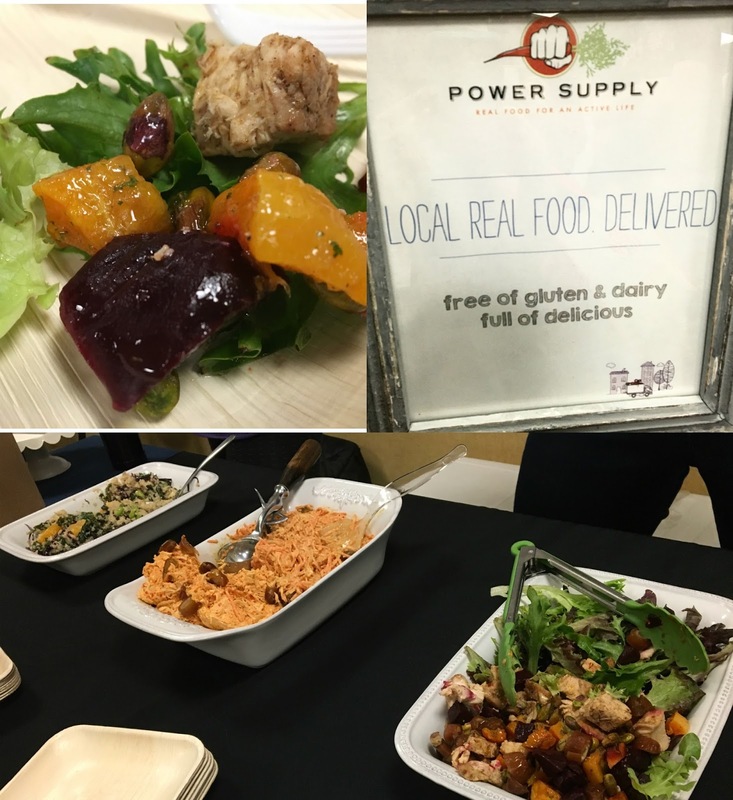 A cool company that definitely caught my eye and impressed my tastebuds was Power Supply, a food prep and delivery company that serves D.C. and Baltimore. As a busy college student who has severed ties with her university's meal plan, the concept really appealed to me, and I was impressed that the meals are gluten and dairy-free. The chicken salad I tried was delicious, and I left the expo definitely motivated to look into trying out this time saving service. Of course in this expo, I leave out familiar brands who I am already a fan of- Enjoy Life Foods, Sweet Note Bakery, Hail Merry and Ardenne Farms. Whole Foods D.C. supported local brands such as Slender Seven Cookie Dough, which impressed me with their commitment to keeping it local. I am thrilled to see so many companies and brands supporting local gluten-free education and awareness efforts. 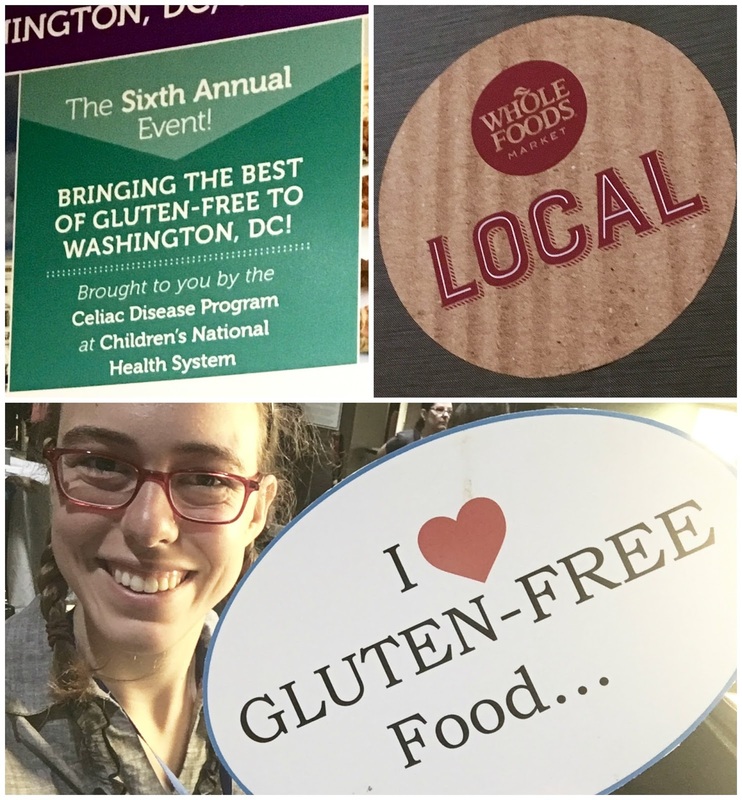 For more information about the D.C. Gluten-Free Expo, click here. I give kudos to the organizing staff for running the expo smoothly and working hard to engage bloggers, which not every expo does. The venue was a bit crowded, but I hope that only means that in future years it can grow into larger spaces and include more companies. Because I always seem to have an abundance of gluten-free samples and coupons on hand, I am giving away my swag from this expo to you, one of my lucky readers. Enter today to win samples, coupons, and literature I picked up on the show floor in Bethesda. I'd be most excited for Rise Bakery. I would love to meet up with BFree! I have not tried their products yet, but am so excited to! Sweet Note Bakery,, I am new to their products, and would love to learn more about them. The Wild Hearts Baking Company products sound great! I'd try them first. I'd say Enjoy Life Foods. I would say Ardenne Farms! Enjoy Life Foods sounds amazing we would love to try them all!